Last Saturday saw us attend our first ‘Mall’ book event. To date we have appeared in a number of busy high street shops with the two books, happy to natter and sign copies for contented customers. What then of the Mall? Our first ‘Mall’ then was Milton Keynes, set in the heart of that modern suburban sprawl of look-alike tree-lined roads and roundabouts, so easy to get lost in. 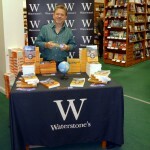 Waterstone’s at Midsummer Boulevard was also the largest outlet we’ve appeared in to date and they had set up the usual table in the shop for the books. For the bike, she was wheeled in through the main door of the Mall and parked right outside the store. Immediately from set-up she was drawing attention. It was a normal busy day in the bookshop with lively sales and a lot of attention but what struck me as different in MK was the number of youngsters we came across. Malls are a great hang-out for kids on a Saturday, a place to socialise with school-friends, maybe spend a bit of pocket money on a treat. But I was delighted by the numbers frequenting the bookstore and even more pleased when they stopped for a chat either with Maggie outside with the bike or me in-store with the books. I say a chat; in some cases it was more of an interrogation as young minds asked probing questions about every aspect of the trip, the bike and the book, absorbing our responses and taking it all in. What struck me was their eagerness to grasp that we were two people who had done something out of the ordinary, non-mainstream, and they were enraptured by the whole idea of our Pan-American adventure. In these encounters, sales were never likely (nor sought for: these are not kids books) but then again that’s not why we have taken to the road with the books; it has been more about getting out there with our story and encouraging others to look at what we have accomplished, the impact the journey has had (and is still having) on our lives and hopefully make one or two take inspiration and think about doing something positive with their own existence. A big thanks to everyone who stopped for a natter and of course the staff at Waterstone’s Milton Keynes for their hospitality and making us welcome!